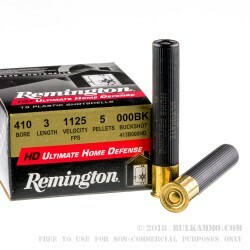 This is a powerful option if you have chosen the .410 shotshell as your home defense preference, either out of a pistol or a shotgun. The ballistic value and the quality construction of this load is superior to most options for the .410 out of either type of weapon. This particular round will perform admirably for those who have adopted the pistol as a tool of choice for personal protection. 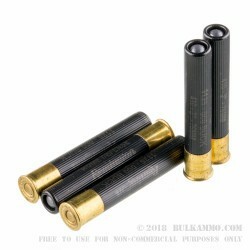 The 5 pellet 000 Buckshot in the 3 inch magnum load is a potent threat stopper in confined spaces. The load is impressive in the shorter distances that will be encountered in the home defense scenario. The 1125 feet per second velocity is speedy but does not contribute heavily to the potential for overpenetration, and the 5 pellet payload is an adequate distribution of lead on target. The well-constructed shells offer excellent reliability in a variety of shotguns and pistols that can chamber the .410 cartridge. 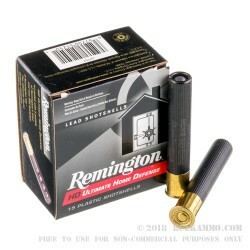 Remington has been offering top tier shotgun ammunition for longer than most companies have been in existence, and their portfolio of shotshell offerings is generally without peer. 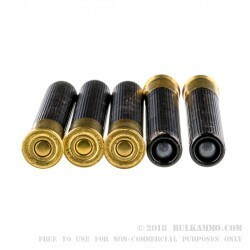 The low flash powder and the 5 pellets of the 000 Buck will combine for effective threat mitigation in short and intermediate ranges where a shotgun makes the most sense, without concerns for overpenetration.